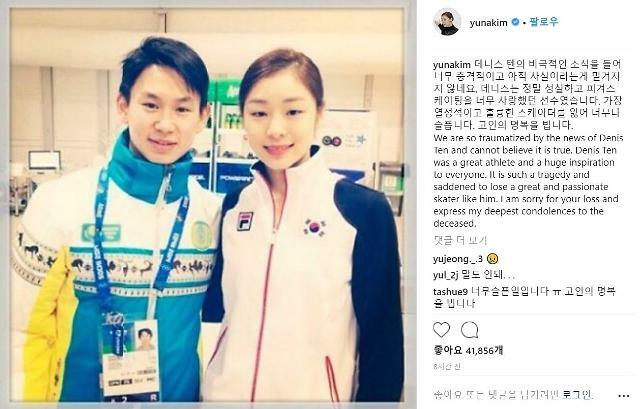 SEOUL -- Former Olympic figure skating champion Kim Yuna and fans expressed deep grief over the death of Kazakh figure skater Denis Yurievich Ten, an Olympic bronze medalist who died Thursday at 25 after being stabbed by robbers in Almaty, Kazakhstan. Kazakh media reported that Ten was attacked while trying to stop two robbers from stealing his car mirrors and suffered a significant blood loss. Ten won a bronze medal in the men's singles at the 2014 Sochi Winter Olympics and served as the ambassador for Almaty's bid to host the 2022 Winter Olympics. In South Korea, hundreds of thousands of online users paid condolences through online comments uploaded onto web portals and Kim's Instagram post. Ten was well known as a descendant of a Korean-born independence fighter. "We are so traumatized by the news of Denis Ten and cannot believe it is true," Kim said in an Instagram post written in Korean and English on Friday. She had maintained close relations with Ten because they were housed under the same management agency in South Korea. "It is such a tragedy and saddened to lose a great and passionate skater like him. I am sorry for your loss and express my deepest condolences to the deceased," Kim said. South Korean figure skater mourned Ten's sudden death. "I can’t believe this news.... When I was in Kazakhstan You really cared about me and cheered me up," Choi Da-bin, an 18-year-old 2017 Asian Winter Games champion, said in an Instagram post. "We have lost such a promising athlete. The tragic news was so painful," wrote an Instagram user nicknamed "sey_rn". Another user "sunjeongbag" expressed her grief: "I supported ten since I saw him in a documentary film. I am so shocked. May him rest in peace."